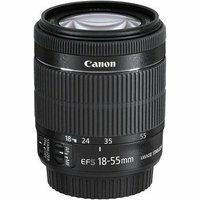 The 18-55mm f3.5-5.6 IS STM zoom lens features Canon's STM (stepping motor) design, to ensure fast, accurate and more importantly, quiet operation. With a focal length of 29-88mm in 35mm format, the lens' wide zoom range is suitable for general photography, including landscapes and portraits, while its minimum working distance at 0.25m (25cm) is great for close-ups. Image Stabilisation reduces camera shake and blur and allows shooting at shutter speeds up to four stops slower than normal. Its lightweight and compact construction makes it extremely portable for travel photography.